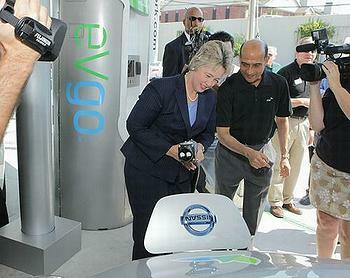 Today in Houston, the city and its electric vehicle partners launched Houston Drives Electric, a city-wide electric vehicle program. The city has just bought its first two all-electric vehicles, Nissan Leafs. Another 23 EVs will be added to the city fleet by year’s end. Today, the electric utility NRG unveiled Houston’s first eVgo Freedom Station site with a new charger that can add 30 miles of range in as little as 10 minutes. Also in Texas, the City of Austin and Austin Energy will develop a plan to develop and implement local codes, expedited permitting and inspections, and procedures to enable charging infrastructure between San Antonio and Georgetown, just north of Austin. Each of the other Clean Cities projects approved today will receive between $300,000 and $545,000. The Center for Transportation and the Environment in Atlanta, Georgia, will use its grant to establish a tri-state readiness and deployment strategy for EVs in Georgia, Alabama, and South Carolina. In Kansas, the Metropolitan Energy Information Center will develop phased EV infrastructure installation plans for the Kansas City metropolitan area and surrounding smaller communities as well as the travel corridors between them. The Oregon Business Development Department will develop a strategic plug-in electric vehicle market and community plan to address next-generation deployment strategies. The plan will serve as a roadmap to achieve Oregon’s goal of 30,000 plug-in EVs by 2015. The American Lung Association of the Southwest will develop a comprehensive electric vehicle and EV supply equipment readiness and implementation plan for Colorado. Similar EV planning projects for Florida, Hawaii, Michigan, North Carolina, Ohio, Pennsylvania and Virginia also got the green light. Secretary Chu also announced funding for seven projects to prepare college students for careers designing and building advanced electric vehicles. The Department of Energy’s Graduate Automotive Technology Education initiative will award $6.4 million over the next five years to support seven Centers of Excellence at American colleges, universities, and research institutions. At Indiana’s Purdue University, a $1 million grant will allow the Hoosier Heavy Hybrid Center of Excellence to train, educate, and equip the next generation of scientists and engineers to address medium and heavy-duty hybrid vehicles. The project goal is to achieve a 50 percent reduction in commercial vehicle fuel use. Nearly $1 million will go to the University of Colorado to create a new graduate certificate in electric drivetrain technology. Another $1 million will go to establish a GATE Center for Electric Drive Transportation at the University of Michigan, Dearborn. The center will build upon the university’s existing advanced degree programs in automotive systems engineering, as well as faculty expertise and research achievements in electric drive vehicles of all kinds. Centers of Excellence will also be developed at Ohio State, Pennsylvania State, Clemson University in South Carolina and the University of Alabama, Birmingham.